No matter how much high praise Kubelik’s 1960s Dvorak cycle with the Berlin Philharmonic has received, I’ve always felt that the Berlin Philharmonic’s glossy, glassy, all-pervasive string sound (thank you, Herr von Karajan) sank the ship despite the effort Kubelik may have put in trying to hammer in some Bohemian style into the Berlin players’ minds, and the bloodless, harsh and screechy sonics rendered some sections absolutely intolerable, even painful, to listen to–the string melody in trio of the 8th’s scherzo, for example, which never fails to send shivers down my spine (but not in a good way). Fast forward the clock to 1975, when Kubelik recorded the Slavonic Dances with his much more comfortable-sounding Bavarian Radio Symphony Orchestra, and finally we can enjoy all of Kubelik’s inimitable grasp of his homeland’s musical idiom without having to puncture our eardrums. When I first fed this disc into my computer and the first chord of the very first dance appeared, I felt like I was struck by lightning. What precision, so clean yet so alarming! Kubelik takes this dance, as well as the other faster dances, at an extremely fast tempo, driving the music at a true Presto and letting no subtleties get in the way. With this approach, the music takes on a dimension of riotous, boisterous wildness and untamed primitiveness that alludes to pieces as variegated as the final dance from Daphnis et Chloe and Rite of Spring. However, despite Kubelik’s furious tempo, he keeps all the rhythms precise and clean, never once blurring the cross-rhythms that make these dances so particularly Czech. The Bavarian musicians respond with magnificent gusto, and the way they manage to hang on with such aplomb at the end when Kubelik injects even more momentum has to be heard to be believed. Are all the dances so hardly driven? Certainly not. The Skočná (Op. 46 No. 7) is one of my favorite dances in the cycle–a dainty, tiptoeing little gem–and, at a relaxing (but not relaxed) tempo, Kubelik reveals all that charm and vivacity, no small part thanks to the characterful double-reed solos: at last, Haitink’s terrific Concertgebouw players have met their match. In the slow dances, and especially the popular Sousedská (the last number of the last set), Kubelik coaxes lush, dark playing from his string and wind players, sensitivity imbuing the music with a tinge of melancholy and deep feeling. Throughout, Kubelik is aided by an orchestra who undoubtedly feel the music better than their countrymen in the north. The strings, while rich, never once cover the characterful, colorful wind and brass. Meanwhile, the hard-sticked timpani, balanced to the fore, offer a solid and incisive base to both the rhythms and the orchestra sonority, while the cymbal player tackles his tricky parts with aplomb. And as mentioned, the playing is fantastic. My copy is an old, out-of-print Galleria issue (the recording’s first CD release), and that’s what the cover photo above is, but you’ll be able to obtain these same performances on DG Originals, whose remastering tames the Galleria release’s shrillness, as I’ve been told. Ultimately, whatever version you own, there’s no denying that Kubelik’s Slavonic Dances are absolutely vital: both in the sense of “having remarkable energy, liveliness, or force of personality”, and in the sense of “an indispensable, essential part of your CD shelf”. 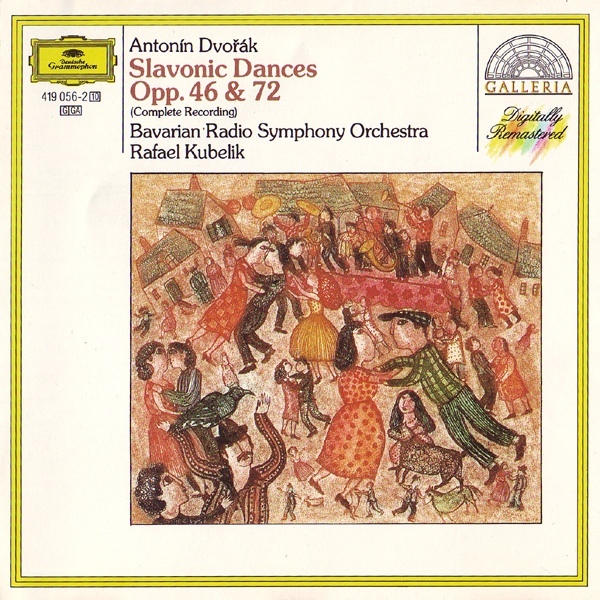 Categories: Reviews | Tags: Bavarian Radio Symphony Orchestra, Dvorak, Kubelik | Permalink. The Kubelik/Bavarian Slavonic Dances can be heard in their entirety on Spotify. There are two listings: one is the DG Originals release from 1998; the other is the DG Trio release from 2002, which is a 3-CD set that also includes Overtures and the Symphonic Variations. Thanks Peter for your discographic addendum! I haven’t compared the remasterings between the Originals and Trio releases though. The English wine press of the 60’s and 70’s has a lot to answer for. It’s not much better these days. At least it now recognizes that there are great Slavic orchestras. If you doubt me, look up any Gramphone review of the Supraphon catalogue in that period. Karel Ancerl’s recordings mainly got very short shrift. As did the Kletzki Beethoven cycle etc etc etc. The epitome of that British prejudice is the way they championed the very mediocre recordings of Sir Simon Rattle. If you want to see what I mean, play Blomstedt’s Nielsen Pan and Syrinx, then play the Rattle. Blomstedt makes exciting music, Rattle gives us a run through. The worst example is Rattle’s Mahler cycle. Every time I hear it I think of a precocious little boy trying to prove how clever he is by drawing out a particular aspect as the rest of it falls in a heap. The best example of that British musical chauvinism is the in the way Barbirolli’s Mahler 5 and Berlin 9 are revered. Barbirolli’s 5th is a sprawling mess and the Berlin Orchestra sounds hesitant, as though Mahler was a foreign composer to them. Which, of course, he was. Thank you Dieter for your comments. While I am in no position to comment on how the British musical press (or indeed, any musical press from any nation) does things, I do recognize that many critics tend to revere artists or performances that I personally have no sympathy for. But as long as they can justify what they think is good with sound, unbiased evidence, then they are perfectly entitled to their opinion. Any differences in opinion can only be accounted for by differences in taste, and thus, as the Latin maxim goes, De gustibus non est disputandum. Here at Top Ear, of course, we have no affiliation to any musical organization (be it orchestra or label), nor do we subscribe to a particular brand of musical criticism, and we try our very best not to be swayed by mainstream opinion. In essence, this means that whatever you read on these webpages represents our honest-to-God opinion. With regards to the recordings you mentioned: I adore Klemperer’s Dvorak 9, Kletzki’s Beethoven cycle (which I just got hold of not too long ago, actually), and lots of what Ancerl does, while I dislike most of Rattle’s Mahler cycle. I also think that Barbirolli’s 5th is magnificent (and I have reviewed it on Top Ear a long time ago). In the final analysis, musical chauvinism or not, I don’t think any critic should write a review that does not actually reflect what he/she truly believes. Of course this may be an idealistic view and impossible to implement in large review sites or organizations where obviously they may have other agendas. But this is at least true on Top Ear, where we source our review material with our own money (well, the local library and Spotify helps sometimes! ), and we hope our reviews reflect that. Thanks for your considered reply. I agree with just about all of it. I was /am very sensitive to pro-British chauvinism in just about any form, being a post war German boy who arrived in Australia in 1956. I found the narrowness of Gramophone and Penguin Guide reviews excruciating. I swear it’s true, but I read a review of a recording made by the Dresden Statskappelle where the reviewer accounted for some vibrato in the horns by the proximity of Dresden to the Czech border, where the brass and woodwinds, according to the British critics, were poxed by the dreaded ‘Slavic wobble’. Now, Nicholaus Harnoncourt, interestingly, in an interview broadcast by by the ABC in early July – it was made in 2013, I believe – said that in his experience if you wanted to hear what first class horn playing sounded like, you listened to Czech horn players, not Chicago….